So, you gave acupuncture a whirl and are feeling relief. But, shortly after your treatment, you discovered a bruise in the treatment area. Naturally, you want to know: is this normal? Adverse side effects of acupuncture, such as slight bruising, are rare (a British Medical Journal survey shows 1 in 10,000 cases). Rest assured: the treatment is still a safe way to treat pain and other health conditions. Why Did I Bruise From Acupuncture? Acupuncture works by stimulating certain points on the body with tiny needles that penetrate the skin and activate self-healing. Though the needles are extremely fine, they sometimes hit small blood vessels, causing a minor bruise to form in that area. Typically, these bruises are painless. It depends on the person, but some bruises may last several days before disappearing entirely. It’s uncommon to bruise from acupuncture, but it does happen occasionally. Apart from its appearance, a small bruise from acupuncture isn’t cause for alarm. 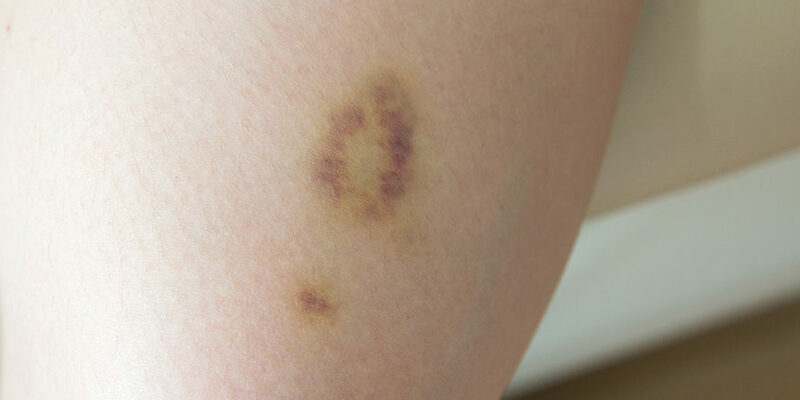 Be sure to monitor when the bruise forms, how it heals and whether it feels sore at any point. When you go in for your next appointment, let your practitioner know the details of what happened. They may be able to adjust the treatment, with even finer needles or a gentler application, to avoid future bruising. When Should I Call My Practitioner? If you receive an acupuncture treatment and afterward experience large bruises, swelling or experience ongoing or severe pain, you should contact your doctor or acupuncturist. You may not be the ideal candidate for acupuncture—it’s not right for everyone—or there could be a problem with its application. Before starting treatment, it’s important to get a full assessment with your practitioner to determine if acupuncture can help your health concern. It’s equally important to ensure your practitioner is qualified to do so. Acupuncture is highly regulated in Canada, and is considered a controlled act for physiotherapists. That means physiotherapists and other healthcare providers must have the appropriate additional education and certification to perform acupuncture, in order to maintain the high expectations of safety and reliability. See The College of Physiotherapists of Ontario for more information on other controlled acts in physiotherapy. Not sure if acupuncture is for you? Book an assessment today, our practitioners can answer any of your acupuncture questions and tell you more about our holistic approach.